A recent analysis showed that the aquaculture value chain in Egypt is mainly based on the production of tilapia (Oreochromis niloticus) and mullet (Mugil cephalus and Liza ramada). The value chain was found to be short with no post-harvest processing (Macfadyen et al. 2011). However, there is a wide spread perception among poor and rich consumers, authorities and even technical staff that farmed fish contains high level of pollutants such as cancer-causing heavy metals, pesticides or hormones. In October 2012, WorldFish facilitated a 2-week mission trip to Egypt for four scientists in the Safe Food, Fair Food (SFFF) project from West Africa and with expertise on fish safety who had been trained in participatory risk analysis. During the mission, tools were developed and tested to assess the safety of farmed tilapia. 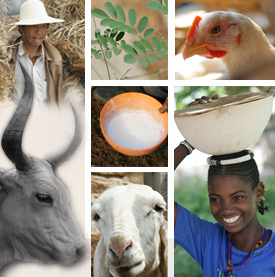 These drafts were later expanded and refined into a generic toolkit by the International Livestock Research Institute in collaboration with the Royal Veterinary College (RVC) and are currently applied in selected animal value chains: Egypt (fish), Ethiopia (small ruminants), Tanzania (dairy), Uganda and Vietnam (pigs). Preliminary results from a very small (convenient) sample of tilapia collected during that initial study suggest that the levels of chemical hazards are rather small – which is of course good news for the industry! These positive findings will hopefully soon be confirmed by the results from a larger and representative sample which is currently being examined and complemented by microbiological analysis. The collection of qualitative data is coming to an end in the project countries and reflection on the tools as well as discussions on how to analyze and present the data in a harmonized way across value chains is underway. The preliminary findings in Egypt, potential areas of further collaboration and possible research questions were discussed during a follow up mission by SFFF principal investigator, Delia Grace, and project coordinator, Kristina Rösel from February 10-14th 2013. Colleagues from WorldFish, Dr Malcolm Dickson, Dr Ahmed Nassr-Allah and Dr Diaa Kenawy, along with Dr Mahmoud Eltholth, collaborator at Kafr El Sheikh University and RVC carried out visits to a range of locations in Kafr el Sheikh Governorate, the center of Egyptian farmed fish production, including the wholesale market, a fish farm and the University of Kafr El Sheikh. The reflection workshop in Cairo revealed a lot of potential research questions! One of them could address the safety of grey mullet eaten as fesikh during the festival of Sham el-Nessim. The ancient Egyptians celebrated a date in spring when day and night become equal in length, which represented the beginning of creation. When Christianity arrived in Egypt, this day was linked with Coptic Easter, falling immediately on Easter Monday. Despite annual warnings by health officials against the dangers of fesikh and reports of tons of contaminated fish discovered in the markets, most Egyptians insist that fesikh is irreplaceable for Sham al-Nessim. Tags: data collection, food safety, RIA, risk assessment. Bookmark the permalink. Reblogged this on CGIAR Research Program on Livestock and Fish.